Students at a Vermont high school are winning praise for their efforts to fight back against online bullying. After a burst of negative posts on an anonymous school news app, students at Rutland High School organized a counterattack. They petitioned the creators of the After School app to take their school's message board down. Then they launched a "Positive Post-it" campaign. Small notes offering praise and encouragement to fellow students were stuck to bulletin boards and windows around the school. They also petitioned the tech giant Apple to remove After School from its App Store. An Apple spokesman said the company had agreed. The app was removed. The app's intended use is to help students to form groups tied to a specific school and post anonymous messages about local goings-on. Instead, comments on Rutland High School's app were "negative, obscene," said Principal Bill Olsen. After School co-founder Cory Levy defended the app. He called it a "blank sheet of paper" that leaves students to decide what to write on it. "We've only just gotten to know these students," Levy wrote in an email. "Their parents have had years to shape their morals and build good decision making skills." John Halligan has been an anti-bullying activist since his son, Ryan, committed suicide in 2003. That was following online bullying by fellow middle school students. He said he had spoken to Rutland students two years ago. Critical thinking challenge: What reasoning did the app's co-founder use to avoid accepting responsibility for the abusive way his app was used? 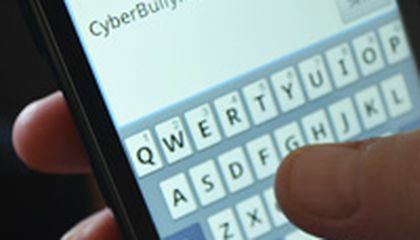 This article was great it shows how cyber bullying affects people.Also it affects schools because there students are being bullied and some are being bullies. And i'm sorry for your loss. The students at Vermont High School did the right thing they saw obscene or negative comments so they started a petition to take the app down. I am truly amazed by the behavior of the students that I have just read about. I was amazed by negative and positive actions. It horrified me to read that students were turning an app that is suppose to keep students up to date on school activities into a blog site meant to bash other students. I was proud to hear that other students, instead of joining in, rallied up to remove the app and make sure that this did not happen to anyone else. People has have always bullied and they might not even know it, but a funny little joke they play on someone with their friends could have a really big impact on the victim no matter how innocent the joke may seem. So I'm glad to see a school finally trying to help their students instead of just putting up anti-bullying posters. I think bullying in general is horrible not just cyber-bullying, but with technology controlling our lives this would hit a big percentage of the issue so bravo. I think that this is great because bullying is one of the most terrible things that is in our schools and you would think school would be somewhere safe but it isn't because of bullying. I am with these students. Cyberbullying needs to stop now and never come back. What people are not realizing is that they are actually making someone want to make them commit suicide. Please stop! Good thing the took down that app, cause it could turn out to be a bloodbath of negative and brutal comments and that can turn into fights and other bad things. I'm proud for Vermont High School, like I said it can turn out to be really bad and who wants a whole lot of bad things going on in a school? I think that is smart of them to do that and tell how stupid cyberbulling is. A lot of teens do suicide each year because of cyberbullying. But we can not stop what other people do.